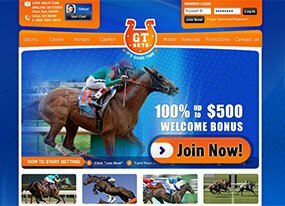 Horse handicappers are welcome at GTbets Racebook! All major and minor North American tracks are supported, and with both high and low wagering limits, the Racebook caters to every type of bettor. All standard wager types are available from Win-Place-Show to Superfectas to Pick 4’s. Races are graded quickly, and betting is allowed all the way to the post time of each race. The Racebook also offers a 15% rebate for net losses on the first of each month, which is automatically deposited into your wagering account as cash!